When you set up a ‘Stars’ tribute fund you can invite people to post their own messages and memories, and you can add your own special memories with photographs, words, music and even videos. 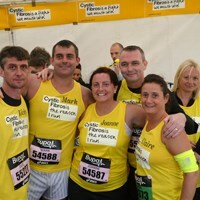 By sharing the fund with those you know and the wider community, and raising money for it, you can keep your loved one’s memory alive and raise awareness about cystic fibrosis at the same time. Your support is vital for us to continue our work in research, campaigning, support and care for those with cystic fibrosis. There are loads of ways you can help, and together we will make a difference to thousands of lives. Whether you want to donate, join an event, organise your own event, take part in a campaign or get your company involved, there's a part for you to play today.